It was a few months back[or is it more than a year already?] that I hopped on to Ria’s blog.I immediately connected with her style of writing and left a comment not knowing that I was the first person to post a comment on her newly-started blog!!Yay.. :).We started commenting on each others blog,chatting on Gtalk and tweeting on Twitter.We exchanged phone numbers too and spoke to each other and it felt so good to actually hear each others voices and giggle over it!! When she asked me to do a guest post for her,I actually got goosebumps.I mean,look at her blog-her recipes,her wonderful pictures,would I be able to do justice to her blog?I was not so sure.But a bride has to have what she wants and this is my humble attempt to “feed” her blog while she’s away.During her pre-wedding “ban” on baking by her mom,she was craving for some Chocolate cake and I didn’t have to think twice about what I was going to bake for her!! at 7:15 AM Labels: Baking , Birthday/Celebration Cakes , Cake , Guest Post. Awesome looking dark choc cake. 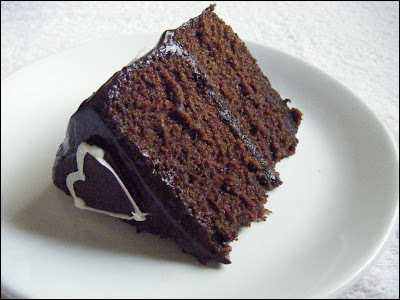 Clicks enhance the richness and the goodness of the cake. looks awesome...I just keep drooling when I visit your blog and now am craving for a chocolate cake..
Cake looks absolutely delicious and tempting me to relish each and every spoon...yummy!! Beautiful cake, i like rias place too she is so chirpy ,fresh and so young, she is like a littles sis for me. Looks so great and yummy. This looks so yummy.The deco is awesome. Love the pic. Lord! the cake looks so perfect and so moist. How are you doing? Its been a while since I have blogged. You have an awesome space and an even greater talent for baking...first time on your space...will be back soon!!! Looks very good. BTW, I am hosting my first event which is on baking. Check it out if you are interested. I crave for chocolate and run towards the oven whenever I come here..Your cakes are amazing! I can have them for breakfast lunch or dinner.. wow!! awesome!!!! so nice of you to make her this beautiful and yummy cake..
First of all lovely blog! Can the cakes be done a day in advance and refrigerated without the frosting?How long would should the cake with the frosting be chilled before it is served? 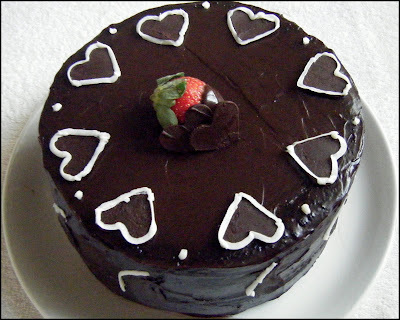 ♥Strawberry Cream Gateau♥ ~ For my Man!! Vegetable Chettinad with Coin Porotta! !